I thought I'd have a look at the contenders for the Labour leadership contest, just to see if any of them gave a toss about Wales. We've already had Andy Burnham tell us that he knew Wales was being shafted when he was treasury secretary but he did nothing about it. Whether he was in a position to or not is academic as he is only mentioning it now that he wants something from Wales. 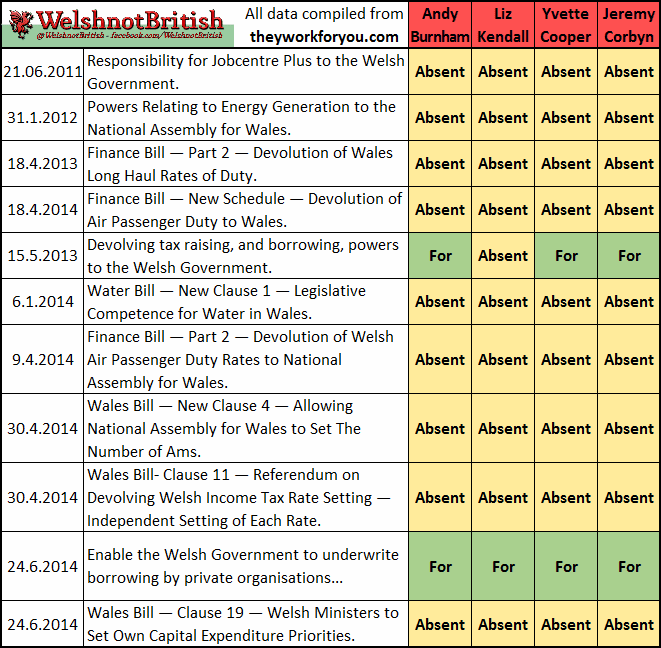 Corbyn appears to be the front runner as far as Labour's grass roots in Wales is concerned but how did they vote on matters concerning Wales? Click the picture to be able to see the words "Absent" a little bigger. Off I trotted to theyworkforyou.com and looked up how each of them did when it came to us, the results are about as depressing as you would expect from a Red Tories MP from England. Even their Wales based MPs couldn't be bothered to turn up and vote for most of the bills concerning more powers.